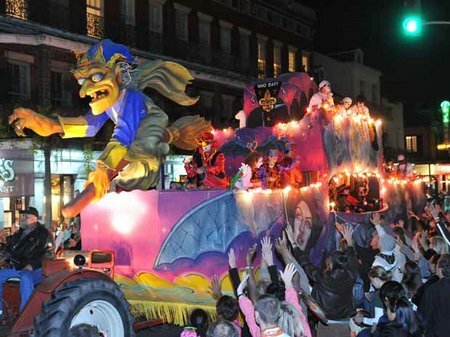 Without doubt, one of the favorite months to visit New Orleans is October. And for the celebration of Halloween, this destination has everything to live a unique experience. Takes note of the activities to be performed and its location. Audubon Zoo and Children’s Hospital presents ‘Boo at the Zoo’: four nights of fear and fun. Among the activities that you can enjoy the small houses are to go for Halloween, plays, children’s shows and the famous Mombasa Ghost Train. Recommended for children 12 years of age and their families. Reserve. From 22 to 30 October 2010. Location: Audubon Zoo, 6500 Magazine Street. Participate in the free Halloween scares, which will take place at the amusement park and Storyland. There will be food, candy, rides, music and decoration. It is recommended to go in disguise. Join the float of Halloween and the Harvest Festival to squash a thousand designs, show off your costume, dancing to live music, menus prepared based on the harvested products and more. Costumed children will receive a bag to store your sweets and may enter at participating stores and kiosks located in Dutch Alley and the farmers market (farmers’ market). At dusk, head to Washington Artillery Park (in front of Jackson Square) to admire the magical lighting of the pumpkins and dancing to local bands. The “Krewe of Halloween ‘presents the annual Halloween celebration this year includes a parade. The costume party is held on October 30, joins the imagination with his alter ego to make way for a celebration ever. This event will wear black and orange decor first, Mardi Gras World fixtures, lighting theme and thousands of attendees in costume. Finally, it is worth mentioning that not all just for fun: the Exhibition of Halloween event is recognized as the most important fundraising Krewe of Halloween. Cost: Free Parade. Costume party: $ 100 per person. The Collection of Historic New Orleans presents this event once again and throughout the month of October. Created in 2009, the now popular tour of the galleries of the History of Louisiana explores the truth behind the most famous legends in the city, as well as the most popular in the French Quarter. During the walk, explore the historical aspects and how they could have been used to create myths and legends that are now confused with that really happened. 10 buildings will visit ‘haunted’ and the history of each will be told based on research conducted at the Williams Research Center. 8 to 24 October 2010 (Tuesday to Sunday). NOTE: This tour is recommended only for adults. Come and enjoy a lineup of top musicians including local musicians, national and international will play on several stages throughout the night. These include the rocker Ozzy Osbourne, Muse, Hot Chip, Interpol, Paul van Dyk, Paul Oakenfold, The Crystal Method, Macy Gray and Kaskade, among others. The magazine recently recognized by Offbeat Magazine, with the award for best music festival, will board the historic City Park, located between lakes, swamps and cedar from the collections of the world’s largest adult, all in the shadow of the Museum Art and minutes from New Orleans French Quarter and the city’s Financial District. This activity is perfect for families. Includes a workshop to decorate cookies, listen to ghost stories, Halloween and more demand. The ‘disgusting’ menu will include: dragon’s blood punch, warts, witch and other surprises. It is recommended to attend in disguise. The activities are planned for children up to age 12.